Well, some of you might be wondering what I am looking like these days and so here I am, this is a very recent photo. As promised, the radiation has caused 100 percent hair loss........ so it's completely bald again for me. 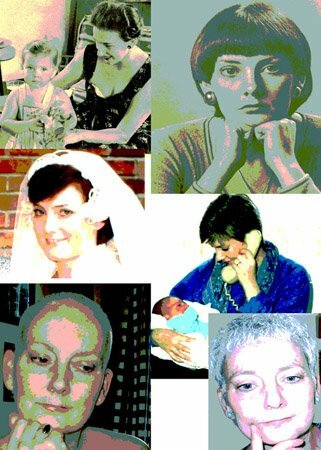 To be honest, I didn't expect to leave the whole breast cancer treatment scene with hair, so it isn't really a big deal. Plus, a little comfort that the radiation is doing what it is supposed to be doing! I am feeling quite fine these days, and thanks to my web of support, I am able to enjoy every minute of every day quite well. I am not exaggerating when I say that I can't wait for each new day to begin. I had an oncologist appointment this week at which we were to discuss chemo, and whether or not it could bring me any benefit. Well, the time has come, and my oncologist does NOT feel like he can offier me very much via chemo, either through time, and definitely NOT through quality of life. It wasn't exactly new news, but still hit kind of hard, as this was kind of the final bridge to be crossed in decision making related to my active cancer treatment. SO.... what this means is that I have decided that it is time to stop active treatment. I do have a very high level of trust in my oncologist, and I would want all my family and friends know that he has known my goals (more time even if it is chemo time) right from the start and has been both respectful and cooperative towards that end. The focus of my care now becomes comfort. I will have any treatment that would improve my care and treatment, but nothing aimed primariy for stopping the cancer. And so, the time I have been given by the palliative radiation is the time I have. And that, as we all know is a mystery that none of us can begin to guess at, but of course, I can't help hoping for the most there can be, life is just too darn good to leave. It's yet more emotional adjustment for the family, but I would say that everyone, kids, my parents, siblings etc... are all graceful and very focused on helping me. It is humbling, but also it is so nice that I cannot utter one thing except my love and gratitude. I'm getting questions about visits again. This is a very tough call, because I must budget my energy with care and I would please ask you to check with my mom or Gord or myself. My energy is very limited, and especially when the kids are all home, Ifeel that my time must be their's. I usually am very good with short phone calls now, I seem to have regained my strength for that, although and email or snail mail is ALWAYS managable. Email is the very easiast and so far, I get from my bed to desk pretty easily. Ah, Joanne. You are the epitome of grace. You truly are. Grace and widsom and nurturing. It shines from your every word. My only comfort from all of this, my only comfort, is that you are sincerely comfortable and happy and content. I pray and hope that this also helps your family to cope, although I know it's not nearly enough. I'm holding your hand right now Jo, whether you know it or not. Joanne, the header of your blog seems even more poignant now... "God asks no person whether they will accept life. That is not the choice. You must take it. The only choice is how." Mattie Stepanek, a physically challenged 11-year-old, wrote a book called Journey Through Heartsongs... maybe you know it. It's a book of poems. He wrote: "Our life is an echo of our spirt today, of our essence, as it is caught between our yesterday and our tomorrow. It is the resounding reality of who we are, as a result of where we have been, and where we will be, for eternity." Isn't that incredible? I think you are a perfect example of that Jo. Keep on living each and every day to it's fullest Joanne, something you do so well. Love you sister! Joanne,It helps to know that you are not in pain and are physically feeling better. Don't worry about how you choose to spend your time. Your family comes first and it shouldn't be any other way.We all love you and miss you and as much as I would love to see you, your family deserves you more and you need this time together. I know you and that you think about your friends and what we need but we all understand that your family gets you first - as it should be! As Always I love you. Joanne, full of grace, bald and very, very beautiful. Your posts are so moving in their honesty, eloquence and clarity. You are continually in my thoughts and prayers and I send wishes for continued comfort in all your days. I read this the other day, and I thought of you. "There is no joy without hardship. If not for death, would we appreciate life? If not for hate, would we know the ultimate goal is love?...At these moments you can either hold on to negativity and look for blame, or you can choose to heal and keep on loving. Those who learned to know death, rather than to fear and fight it, become our teachers about life." You are such a wise teacher to me. Ah, Joanne, what a difficult letter that must have been to write. Gracious, beautiful, eloquent, wise, compassionate - the words have all been used. Please know there are many hands joined together holding you in an energy just for you, each one whispering the same words, each hoping the same thing, and in the silence of our hearts, asking for you and your family everything beautiful and good that still can be. I "know" you through Fe, and I admire you and the way you look at life, although that must be very hard. You give and receive a lot of love. Please know, I'm thinking of you too. A clear sighted honest appraisal of the toughest of circumstances. I'm glad you are feeling good enough to enjoy your days and that your wonderful web of support is there to help you. As Joan said you are the epitome of grace and I'm glad to have kept company with you these last few years. Rest up and spend treasured time with the kids. It says it all I think. It's good to hear from you again. As is expected, each time I check your blog to catch up, I find you dealing with your challenges with courage and acceptance. You have always managed to be positive and grateful for what ever blessings come your way and you remind me to remember mine. There are no new words I can say that you have not already heard, your circle of family and friends is so loving and so sincere. The quality and quantity of their comments speaks volumes on the difference you make each time you drop us a line. We continue to keep you in our prayers and wish you everything good. God Bless. I found your blog in a google search about lung nodules (my doctor found one in my chest and I'm researching them). I've spent the past 2 hours reading your blog and I am inspired by your positivity, fighting spirit and grace.